1.1Help Gostica raise the vibrations and SHARE this article with your family and friends. 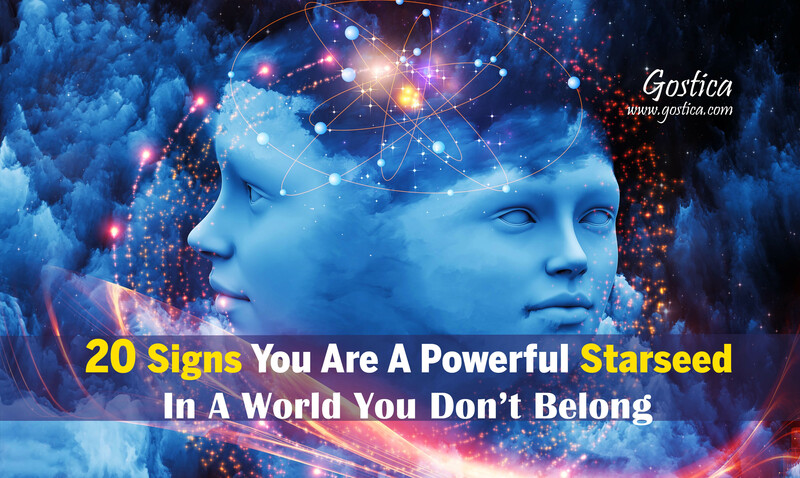 Here are 20 Signs You Very Well May Be a Starseed… Keep in mind, this is just a start. Do you feel like you’re from another dimension or another planet? This is one of the top signs you are a Starseed! As you open your heart, raise your vibration, and reconnect with who you authentically are in the present moment, as a result, more of the truth about your origin will come to light as well… One step at a time. 1 You didn’t fit in as a child and felt far different from other kids. You may have been advanced as a child in some way like talking, walking or reading much earlier than your peers. 2 You have a strong feeling of wanting to go home, and have a feeling sense of what this “home” is like, even if you can’t put it into words. 3 You’ve had strong psychic and paranormal experiences as a child, which continue into the present. Seeing spirits, seeing past the illusion, into the future or beyond the lines of time, having prophetic reams, seeing a UFO or having an alien encounter are all somewhat “normal” experiences for starseeds. 4 You’re highly sensitive (sometimes to what seems a fault). 5 You’re strongly empathic and can feel the emotions of others, and possibly hear their thoughts allowing you to easily read people. 6 Communication may seem slow and sometimes painful for you when you already know what the other person is going to say sometimes before they even do. 7 You have a deep inner wisdom, and you feel timeless… Maybe you’ve even had dreams or memories of off planet past lives and experiences in totally different dimensions and ways of existing. 8 You have a strong sense of your personal mission, even if you don’t know what it is yet you have the burning desire or feeling that you’re meant to do something big. 9 You have intense and vivid dreams that often take place in places and times which are off planet. Some of these dreams are so vivid they seem more real than reality. 10 Small children and babies seem to fascinated by you, like they’re able to see your uniqueness and your bright light. 11 You have a deep connection with nature, with plants, animals and the physical elements and you seem to be able to communicate with them on a level. 12 You don’t fit in with society… Others consider you to be strange, weird or different and may be somewhat wary of you. 13 You may not have many friends, and those who you do connect with you seem to have a deep and complex relationship which spans time and space. 14 You may even feel alienated by your parents and immediate family, like they just don’t get you, and you don’t get them. You may have even wondered at times if you were adopted. 15 You’re very aware of energy and how the energy of others can affect you. 16 You’ve likely created energetic protection techniques to be able to handle being around others, and even still large crowds or busy places can energetically overwhelm you. 17 You have natural psychic gifts and channeling or energy healing abilities. 18 You have a deep understanding of the greater workings of the universe, and of the Divine which comes from within you. 19 You know you are starseed, and your true origin is not as a human. You may even know of a planet, or galaxy in which you’ve spent most of your time. 20 You know you’re here from the stars to serve humanity, and earth in reaching the higher dimensions, and you are actively taking steps to remember more of your souls truth, and to accomplish your purpose as a star being. You know that you’re more than just a physical being, and that your true essence is as a spiritual light being. Whether you resonate with being a starseed or not, you are a spiritual being in physical form with a unique mission and purpose. Star seeds aren’t any more or less special than anyone else, we are all created from the same source and right here and now is your time to shine. all the starseed have free will ? or they are trap here forever?